In the late 1860's the area now occupied by Inverness was settled by A. D. Tompkins, and was appropriately named Tompkinsville. In order to attract more settlers, he erected a sawmill and established mail service. His brother-in-law Frank Dampier laid out the town and built a general store. Logging was a booming business in central Florida, and the Tompkinsville sawmill attracted many settlers with the promise of jobs. By the late 1800's, the town had a reported population of about 250 people. In addition to the original area homesteaded by Tompkins, many additional land purchases were made which expanded the town's boundaries. In 1887, Citrus County was created when the huge area of Hernando County was split into Citrus, Hernando, and Pasco Counties. With the creation of the new Citrus County, a county seat had to be chosen. And after a heated battle between supporters of Mannfield and Tompkinsville, the town of Tompkinsville finally won out and was chosen as the county seat in 1891. Sometime in the 1890's, a Jacksonville company agreed to purchase the town and build a new courthouse as part of the bargain. Subsequently, the name was changed to Inverness. Legend has it that a prominent member of the firm that purchased the town was a Scottsman, and the view over the numerous lakes to the east reminded him of his hometown, Inverness, Scotland. Inverness promotes itself as a "bicycle friendly" city, anchored by the Withlacoochee State Trail - the longest paved multi-use trail in Florida. 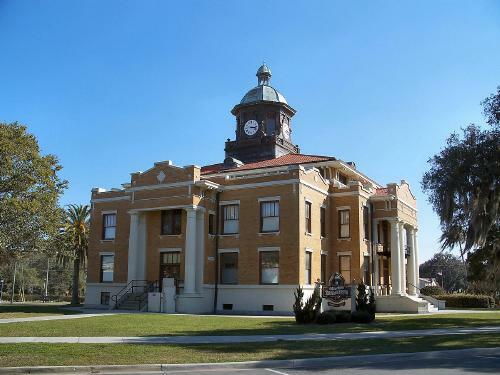 In the historic downtown area you can still visit the historic courthouse building, where the Citrus County Historical Society operates a history museum. The building is known for its copper cupola and clock tower, and was featured in the 1961 Elvis Presley movie "Follow That Dream". You may also want to visit the newly renovated Valerie Theatre, which dates from the 1920's silent film era. And finally, the Crown Hotel, originally constructed in 1880, is one of the oldest buildings in town - although it has been converted to an assisted living facility. Inverness is also home to a variety of annual festivals. In keeping with its UK rooted name, the city hosts one of the largest St. Patrick's day celebrations in Florida, including a parade and street party. The Cooter Festival is a three-day music festival held the last weekend in October. In November the Inverness Grand Prix & Motorsports Festival is a sanctioned kart race through the downtown streets. Click the Visitor's Bureau link below for more details on events.